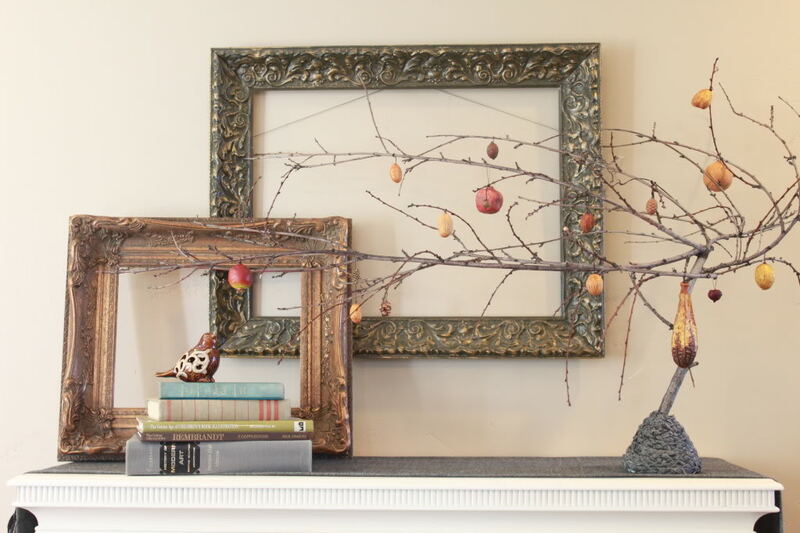 PS: If you don’t have a mantel, now is great time to add one or build a floating shelf that can pretend it’s a mantel. Whatever you decide to do, I want to see — come share at this weekend’s party for a chance to be featured by Remodelaholic! This gallery of empty gold frames by Everyday Lovely is ready for fall and will easily transition to the other fall holidays, too! Add some fun cut-out creepy silhouettes for Halloween, and add a cornucopia (or leave as is!) for Thanksgiving. If you’d rather not hang all those frames, just stack a couple to give your mantel some depth. Whether you use regular old popcorn in a jar or brightly color Indian corn like 33 Shades of Green shared here on Remodelaholic, corn adds texture and warmth to your seasonal display. A simple row of green apples looks stunning up against this bright blue wall on My Sister’s Suitcase. Real or fake, line them up or toss them in a basket to add a simple touch of one of fall’s best crops to your decor. A handful of branches in a vase is simply classic autumn — and easy to come by! Twenty Something stuck her branches in rice and added some beautiful pumpkins from a local patch. It’s not fall without the changing leaves. Capture them while you can and put them in a lovely vase surrounded by a few gourds and deliciously old books (Saidos de Concha via Flickr). A bundle of wheat will stand on its own and help your mantel shine! See how The Lettered Cottage created this look. Brown craft paper or brown paper bags are cheap to come by. These simple brown paper flowers by A Place For Us extend the beauty of the mantel up the wall. Straw (or sub in raffia) is great for adding texture to a fall mantel. The Lettered Cottage used loose straw on the top of her mantel and a small hay bale to add height for the pots and pumpkins below. The rough texture and hand-drawn goodness of a chalkboard fit the autumn rustic feel perfectly. You can make a simple chalkboard platter like SAS Interiors did. This mantel combines so many great elements! The layered empty frames and stack of books look fantastic next to The Rooster and The Hen’s handmade potpourri Halloween tree. Fall is about the freshness of spring and summer turning gold and, well, decaying, so weathered wood fits the bill perfectly! The Frugal Homemaker used part of an old pallet as the centerpiece of her fall mantel. I can’t leave Halloween out… I love this fun Harry Potter mantel that Gina from The Shabby Creek Cottage put together for her “Potterhead” family. And this mantelscape by Pottery Barn (via Lil Luna) is perfectly spooky and old! …or a heartwarming seasonal message of thanks (from craft store paper mache letters taped to the wall), like The Lettered Cottage did. What is your favorite element of fall decor? I love how easy and versatile pumpkins are! I’m excited to see what you’ve been doing this week! Are you finishing up summer or diving into fall? Share your latest and greatest! We had so many great links last week — go check them all out here, and here are a few of your favorites and mine. Link up this week and you could be featured here on Remodelaholic (we often invite party-goers to be our guests) or on social media and our reader features board with over 70,000 followers! Oh – so much inspiration! I don’t know which one I love the most! Thanks for hosting! I love the mantels – I’m inspired to get mine looking better! Thank you for hosting the link party!